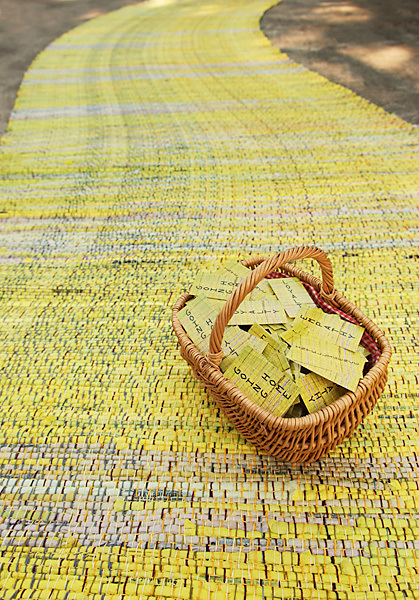 "The Yellow Brick Road" was hand woven using 4500 plastic wrappers from newspapers. These plastic wrappers were given to me by a multitude of people in the community, my weaving made possible by the kindness of those who follow their own brick roads of daily events. Most of us are familiar with L. Frank Baum's /The Wonderful Wizard of Oz /from which the 1939 movie was taken. Dorothy and her friends walk the Yellow Brick Road to seek the Wizard who will grant their wishes. Her friends are Lion, who lacks COURAGE; Scarecrow, who wishes for a brain (INTELLIGENCE); Tinman, who desires a heart (EMPATHY), and her dog Toto, who stands for LOYALTY. In the end, Dorothy just wants to GO HOME. We are all on a journey. Some of us wish our path could be as simple as following a magical yellow brick road, one that leads us to fulfilled wishes. Here is your chance. Grab a card and follow the Yellow Brick Road. Let me know if you meet your wizard at the end. Better still, perhaps you'll make a new friend on the journey. Looking forward seeing you at Luminaria 2014 Nov 7th & 8th from 6 pm till midnight. 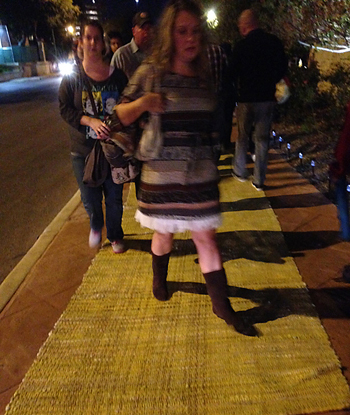 The Yellow Brick Road will be at the corner of Augusta and Navarro street, on the side of the Central Library.